Persians make some awesome stuff, like rugs and cats, but did you know they also built cars? Today's Nice Price or Crack Pipe Paykan is comes from Iran, but will its price rock your casbah? If you've read the graphic novel Persepolis, or seen its film adaptation, you probably get the idea that growing up in post Pahlavi dynasty Iran is no piece of bamieh. But while the current Islamic Republic government doesn't have much use for relations with the US, that doesn't mean that Iranian car nuts don't still love American muscle cars. Maybe they seek the warm embrace of Detroit iron due to their own nation's utter lack of performance-oriented street wear. Instead, when industrial manufacturer IKCO decided back in the ‘60s to introduce an Iranian-built automobile, they went for practicality over performance. 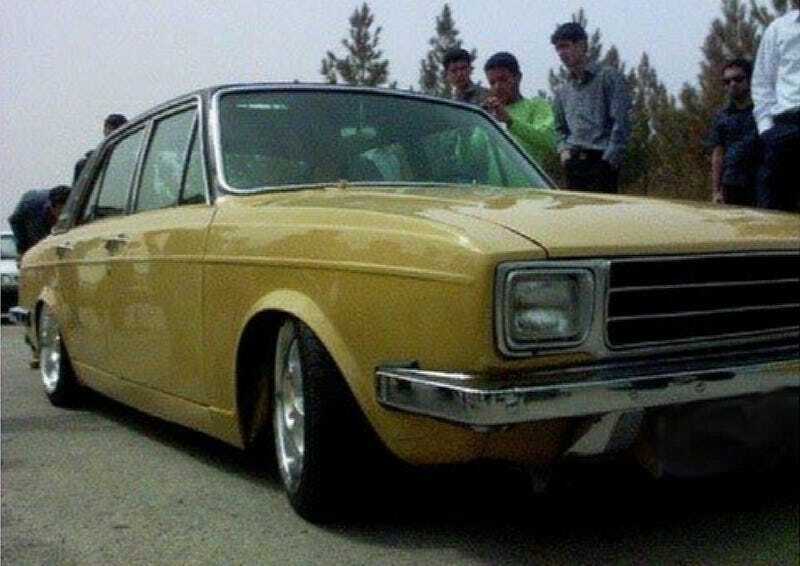 The resulting Iran Khodro Paykan was a license-built edition of the Rootes Group's Hillman Hunter, a handsome if plain three-box sedan that looked a little like the result of a drunken one-nighter between a Volvo 140 and Ford Cortina. Actually, production of the Paykan for more than a decade following its 1967 launch was via knock down drag out kits supplied by the Brits and then assembled in IKCO's Iranian factory. Originally powered by the Rootes Group's 1,725-cc four (shared with the Sunbeam Alpine!) the Paykan switched to Peugeot power after that company bought the bankrupt Brits from Chrysler. The Iranain version of the 504's 1,796-cc engine outlasted even Peugeot's local production, requiring the tooling to go to Iran where, for its final years, the Paykan became all-persian. This stanced Paykan is of questionable age and even more uncertain lineage. Claimed in the ad to have been secreted out of Iraq by one of our fighting men and women, it is now said to be living in, of all places, Minneapolis. What kind of deal was made with some guys at the border, and why does the seller say he was serving a term in Iraq like he was in prison there? The whole ad in fact is about as dubious as Iran's ‘non-military' nuclear program, and with all the pictures showing the car surrounded by folks who look more middle eastern than midwestern, you have to wonder what's going on. Still, it's supposed to be in Minneapolis, and people there are far too nice to pull scams. Plus the ad does say No tire kickers. No lowballers. No freaks. No geeks. so you know the seller is serious. He additionally says that women are so taken by the Paykan that they literally jump into it at traffic lights. Now, considering the current political climate back in Iran, were that to happen to you then they better be your wife, sister, or mom as otherwise you could get in trouble. 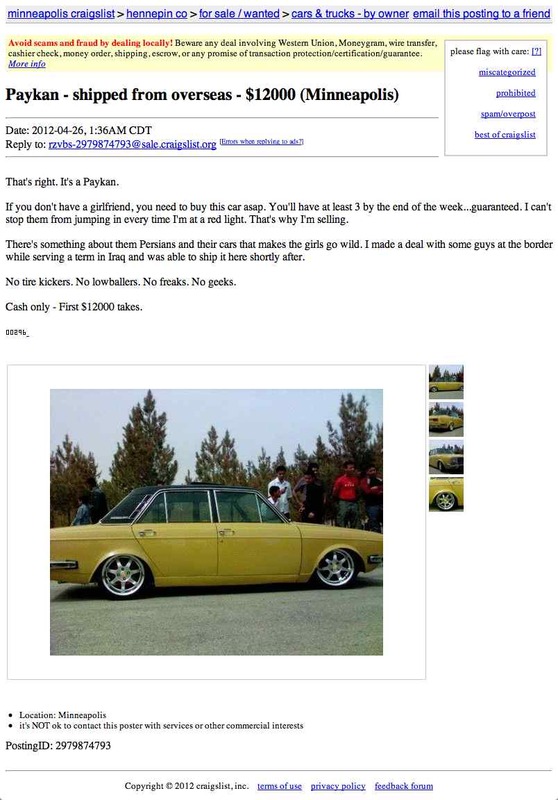 Best probably to drive this Paykan with the windows up and the doors locked, just to be safe. Also safe is the assurance that registering a Paykan here in the land of Freedom Fries will be nigh on impossible. Perhaps if you have an old Hillman VIN you could get around the awkward interaction at the DMV trying to register a car from a country against which the US has trade sanctions and export restrictions. But, should you be up to the challenge, you'll first need to buy the car and doing that requires $12,000 American. That's way short of the forty asked for this one, but is it still so much that it will have you singing Iran, Iran so far away, I just ran, Iran all night and day. . . that much I wouldn't pay?